TWO FREO COMMUNITY INFO SESSIONS TODAY! A reminder that there are two community informations sessions in Fremantle later today. From 5.30-6pm you can look at the latest plans for the Woolstores shopping centre redevelopment at the City of Fremantle at Fremantle Oval. And from 6pm at the Beaconsfield Primary School City staff will explain the options for traffic calming and pedestrian crossing at Scott Street and Hampton Road in South Fremantle. Comments Off on TWO FREO COMMUNITY INFO SESSIONS TODAY! Late yesterday afternoon the test results by ENVIROLAB came back that the soil at the Fremantle Workers Club in Henry Street contains asbestos. Earlier in the day the City of Fremantle notified residents that no asbestos had been found in samples from the Lance Holt School which is opposite the former club. It is advisable for parents who drop off their children on foot or bike today to enter Henry Street from Phillimore Street so that they don’t have to walk past the development site. Better to be sure than to be sorry! It is remarkable that the developers, who have shown documentation that they did asbestos checks in January, have not taken more care and that the asbestos was only discovered now because the community went public on social media with it. Everyone knows that older buildings in Fremantle are very likely to contain asbestos, so why not take extreme care, especially opposite a primary school, and double check. Questions we would like to see answered: Why were soil samples not taken before? How much of the soil has been disturbed and for how long? Will the City of Fremantle take legal action against the developers? The ARTE RICCA 2016 art show opens this Friday September 9 from 6-8 pm at the Beehive Montessori School at Curtin Avenue, Mosman Park, just past Fremantle’s Leighton Beach. There is a large list of highly-regarded WA artists on the list of exhibitors, such as Alessandra Rossi, Annette Orr, Ben Joel, Eveline Kotai, Giles Hohnen, Jillian Green, Jon Denaro, Marrie Hobbs, Olga Cironis, Paul Moncrieff, Penny Coss, and many more, so all you art lovers, and more importantly art buyers! go and have a look. The exhibition is also open on September 10, 11, 12, 16, 17 and 18. The 30% commission becomes a tax-deductible donation to the school for the artists, and it funds the school’s Artist in Residence program. Arte Ricca supports Beehive Montessori’s Capital Gifting Program, and this year proceeds from the exhibition will contribute to the school’s Artist-in-Residence Program. The Hilton Primary School is looking for votes to win a free design and help with their community nature playground. The vision is to provide a space for children and the community to play, learn and grow together. The BEACONSFIELD PRIMARY SCHOOL are looking for parents who are entertainers (musicians, magicians, whatever your talent may be!) 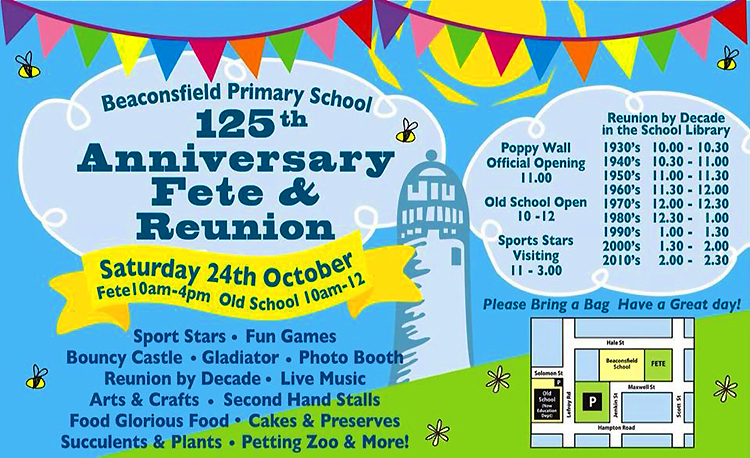 who would like to perform as part of the school fete on Saturday, 24th October. If this is something you would like to do please contact daniellewares@hotmail.com to register your interest. It should be a fun day, so be part of it! Nice to see parents walking their children to school instead of dropping them off in posh 4WD. 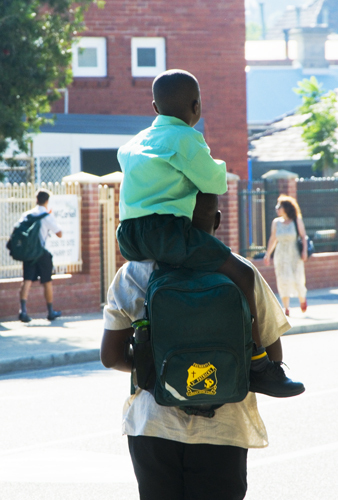 This boy really enjoyed the ride on his father’s shoulders to Fremantle St Patrick’s Primary School this morning. Dad walked too fast for my old legs to catch up and take a photo from the front unfortunately.